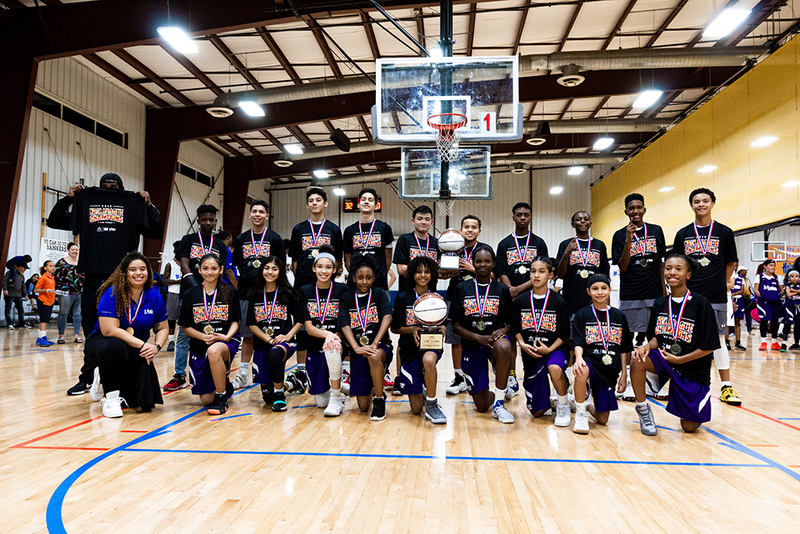 The second full season of the Summer League Jr. NBA’s Friday Night Hoops ended with the 2018 Fall League Championship game this past Friday at the Tarkanian Sports Academy in Las Vegas. We’d like to congratulate both the Girls & Boys Champions on securing their wins! In the Girls division, the #2 seeded Sparks, led by Coach Taylor, defeated the #1 seeded Dream to earn their gold. In the Boys division, Coach Martez and the #1 seeded Cavaliers defeated the #2 seeded Lakers to claim their first Championship! 2018 Summer League Jr. NBA from HallPass Media on Vimeo. The 2018 Summer League Jr. NBA Fall League consisted of 8 teams, 4 boys and 4 girls – grades 6-8, with a total of 80 student-athletes participating throughout the 6 weeks of game play and practices. Outside of the gym, the Tomorrow’s Stars Foundation and the Summer League Jr. NBA staff & student-athletes took part in a number of community relations programs such as the Harvest Mile 58 Mile March, the “Three Point Basket” Thanksgiving Drive, Veteran’s Village 5K and more. These programs help continue to fulfill the goal of the Summer League Jr. NBA: to assist the youth throughout Southern Nevada and to provide them with healthy programming focused on leadership, sportsmanship, and accountability while instilling positive core values. In its continued efforts for funding the Summer League Jr. NBA, the Tomorrow’s Stars Foundation executed a huge Giveaway contest to bring awareness and reward those who continue to show support. The giveaway included $1,500 in prizes with the following: 1 $500 Amazon gift card, 5 $100 Target gift cards and 10 $50 iTunes gift cards. We want to thank everyone involved in the Summer League Jr. NBA for their tireless effort in making this the best season yet!